Do you wish you could get more use out of your deck in the evening? Many homeowners have a deck, or outdoor space which they don’t feel comfortable using past sundown because of the space’s lack of proper lighting. In honor of May being Deck Safety Awareness month, we want to focus on a facet of deck safety that goes beyond structural. The North American Deck and Railing Association has declared May as Deck Safety Month. NADRA recommends having adequate lighting on your deck to improve deck safety as part of their consumer deck safety checklist. 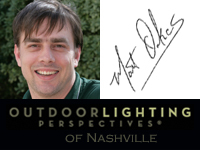 Outdoor Lighting Perspectives of Nashville wants to take this opportunity to focus on making your deck safer by adding outdoor lighting. It is true that having a deck that is structurally sound is important. Ensuring a sure footing and the changes in elevation that are part of many deck designs are the main reason deck lighting is crucial to the safety of your deck space. When we consult with homeowner’s and take a stroll around their property to look for areas that in the most need of outdoor lighting, decks are usually at the top of the list. 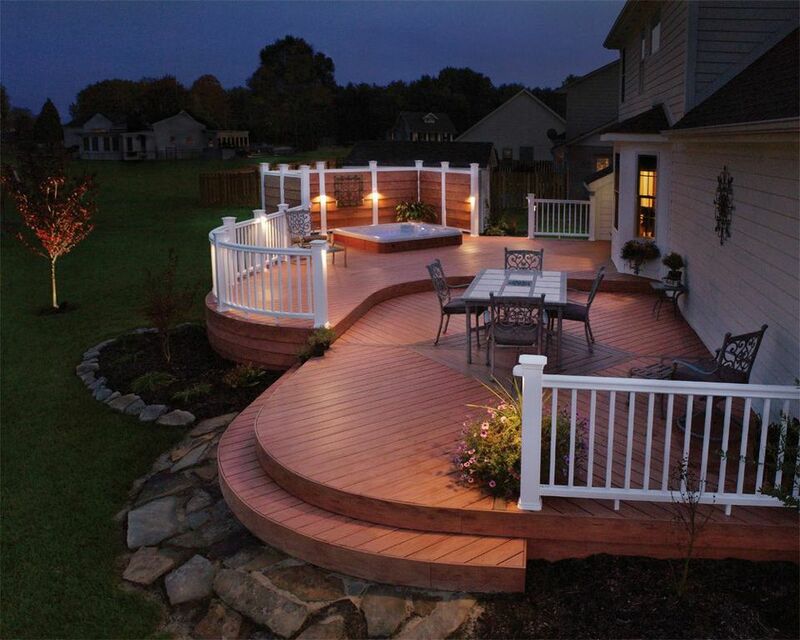 When it comes to the options and placement for deck lighting, the possibilities are abundant. A common place to add outdoor lighting to a deck space is at the top of the posts or along the railings. 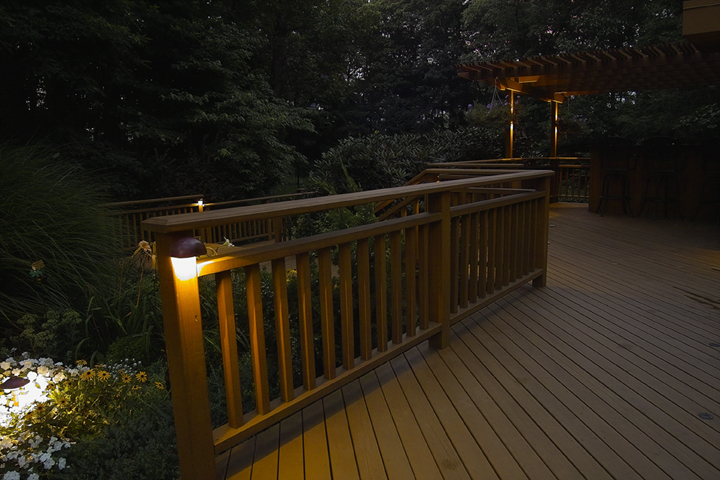 We can also add deck lighting to areas that are often overlooked but add a plethora of light to help you navigate your deck space during the evening. One such location is under any bench seating you have present on your deck, another is the use of LED rope lighting that is placed on the underside of the railing. The stairs present the most danger to your deck space because this is the area where most deck accidents are likely to occur. Stairs need to be made clearly visible to prevent trips or falls. Outdoor Lighting Perspectives of Nashville focuses on two distinct areas when we add lighting to the stair area of your deck. These are installing lighting on the railing, and installing lighting on the vertical area of the step itself. Both of these methods will help you and your evening guests travel your deck stairs safely by adding increased visibility. 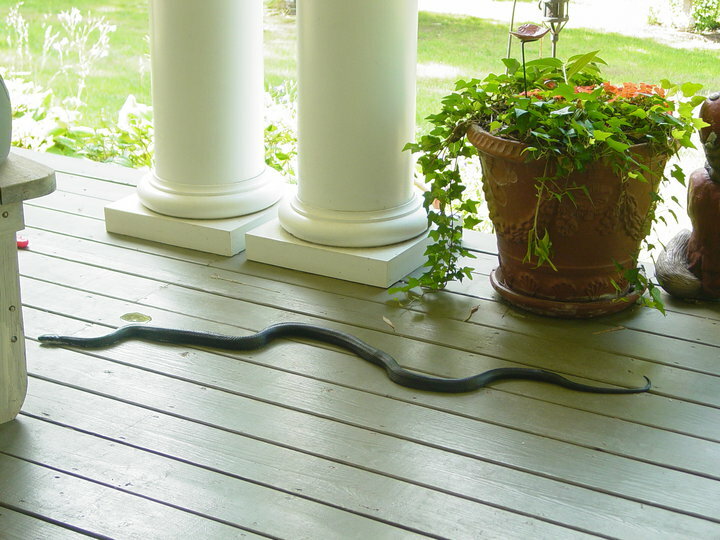 This photo was taken by a customer who experienced a snake coming onto her deck and porch area. We added outdoor lighting to increase visibility on her deck and porch space. Increasing visibility in your deck space will not only help you navigate and utilize your deck with safety in mind, it will also raise awareness of any object that may be present in your deck space that shouldn’t be there. Storms and wind can blow limbs and debris onto your deck which can pose a safety hazard. In rare cases, we have also had homeowner’s call us to install deck lighting because different types of wildlife were showing up on their deck in the evening. Our lush Nashville area backyards can sometimes place nature a little too close for comfort. Having adequate lighting on your deck will deter animals from entering the space at night. Adding outdoor lighting to your deck space will increase safety and set the stage for endless evening enjoyment in your outdoor space. With deck lighting sundown will no longer dictate the end of your outdoor living enjoyment! For more deck and patio lighting design examples visit our deck and patio lighting gallery located on our website. This entry was posted in Deck lighting, Outdoor lighting fof enhanced safety and tagged . The North American Deck and Railing Association, Deck lighting for safety, Deck Safety Awareness month, May is Deck Safety Awareness month, May is deck safety month, NADRA, NADRA consumer deck safety checklist, Nashville deck and patio lighting, Nashville deck lighting, Nashville deck lighting specialists, Nashville outdoor lighting safety, Nashville safety lighting by outdoorlightingnashville. Bookmark the permalink.